In 1948-1949 Hartshorne lectured in German at the University of Frankfurt am Main and in French at the Sorbonne in Paris. During this time he met Anders Nygen, Karl Barth, Karl Jaspers, and Jean Wahl. On his return to the United States he took up his duties as president of the Western Division of the American Philosophical Association (1949). His friend Charner Perry advised him that in his presidential address, “You must not talk about God.” Hartshorne obliged and gave a talk titled “Chance, Love, and Incompatibility,” a lively defense of his metaphysics that makes no explicit mention of God. In Reality as Social Process (1953), however, the book in which this essay originally appeared, Hartshorne did not follow Perry’s advice. This book restates the case for Hartshorne’s theistic metaphysics and, like Beyond Humanism, points to the limitations of both religious and nonreligious humanistic philosophies. Philosophers Speak of God was also published in 1953. Hartshorne and his student William L. Reese collected writings from philosophers throughout history on the question of the nature of God. Critical and appreciative commentaries from the standpoint of panentheism follow each selection. A unique feature of the book is the inclusion of philosophers, both well known and obscure, from both Eastern and Western philosophical traditions. For example, alongside writings by Plato, Aristotle, Aquinas, Hume, and Kant there are selections from Ikhnaton, Buddhism, Ramanuja, Iqbal, and Lequyer. Hartshorne’s approach to philosophy was never parochial, a characteristic no doubt encouraged by his many trips abroad. 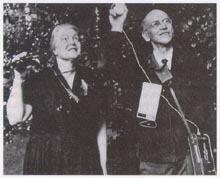 While at Chicago, Hartshorne began the serious study of bird song. In 1951-1952 he visited Australia and New Zealand where he met philosophers such as J. J. C. Smart and J. L. Mackie and pursued his interest in oscines. He spent the summers of 1952 and 1953 studying ornithology in northern Michigan. During the first summer he hit upon the idea of a “monotony threshold,” which he tested the following summer. The hypothesis is that birds that repeat the same song will have marked pauses between songs, and birds with more varied repertoires will not repeat the same song without interspersing other songs. The theory behind the hypothesis is that birds have a primitive aesthetic sense. The theory does not depend on his metaphysical view that feeling is pervasive and efficacious in nature, but it is clearly in accord with such a view. As Hartshorne and his wife traveled around the globe, he continued his study of birds and made many recordings of their songs. He published his major statement on birdsong, Born to Sing: An Introduction and World Survey of Bird Song, in 1973.Philosophers Speak of God was also published in 1953. Hartshorne and his student William L. Reese collected writings from philosophers throughout history on the question of the nature of God. Critical and appreciative commentaries from the standpoint of panentheism follow each selection. A unique feature of the book is the inclusion of philosophers, both well known and obscure, from both Eastern and Western philosophical traditions. For example, alongside writings by Plato, Aristotle, Aquinas, Hume, and Kant there are selections from Ikhnaton, Buddhism, Ramanuja, Iqbal, and Lequyer. Hartshorne’s approach to philosophy was never parochial, a characteristic no doubt encouraged by his many trips abroad.